The best minds of our generation have graduated from "thinking about how to make people click ads" to thinking about how to make people click "the buy button." Facebook is letting small and mid-sized companies test it for free, but we know how that ends. Silicon Valley fetishizes youth—the 20-something, white, over-worked male who will write code until his wrists tingle. That's just great, unless you happen to not be those things. Case in point: a new lawsuit against Twitter complains the company fired a 57-year-old employee because of illegal age and medical bias. 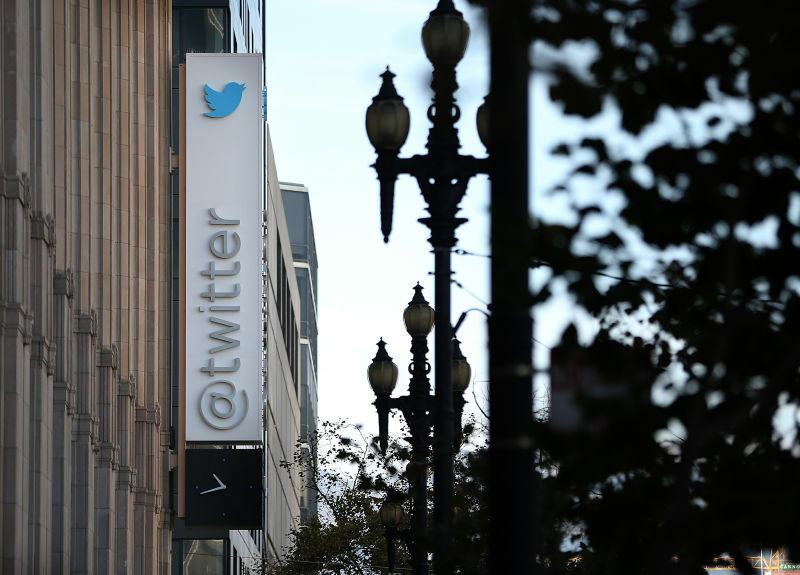 Twitter's CFO has stepped down and been replaced by former Goldman Sachs banker Anthony Noto. Noto recently helped take Twitter public, but was branded "Anthony No Dough, Anthony Don't Know" during the dot-com bubble by ignoring financial data and hyping disasters eToys and Webvan. Silicon Valley famously spent years refusing to talk about its diversity problem. But in the last month, some of the nation's biggest tech companies became more transparent about their demographics: Google, Facebook, Yahoo—even LinkedIn—all released diversity reports. However, Twitter is refusing to get with the times. Twitter says it did not block accounts from Ukrainian national groups, denying claims by Russian officials trying to shut down content they consider extremist. Rather, Twitter says it instructed officials on how to report illegal content, part of its strategy for dealing with oppressive governments. In April, the Wall Street Journal asked us to "Meet Twitter's Mr. Fix-It: Ali Rowghani." Today, Rowghani tweeted some news: he's done with the company, effective immediately. 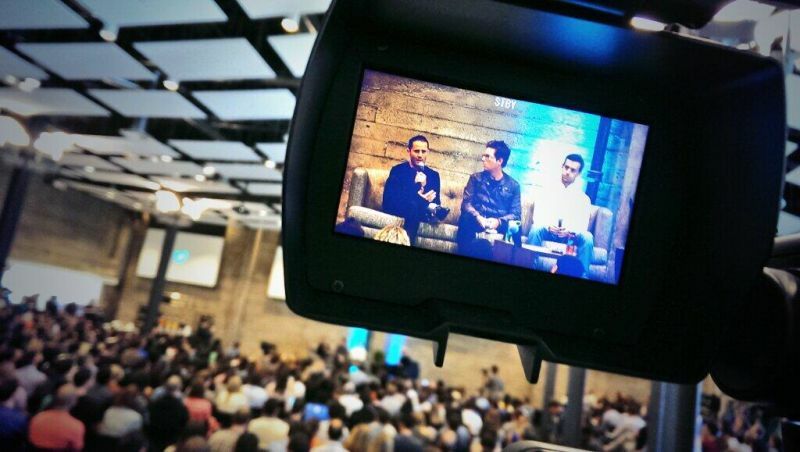 Jack Dorsey Insists He's "Still a Punk"
Jack Dorsey was once a punk. He played in bands, his hair was a loose mess, he had *a tattoo*, and his website was littered in cuss-laden poetry. But then he traded his nose ring for Dior glasses, co-founded Twitter and Square, and amassed a fortune that affords him $10 million seaside homes. 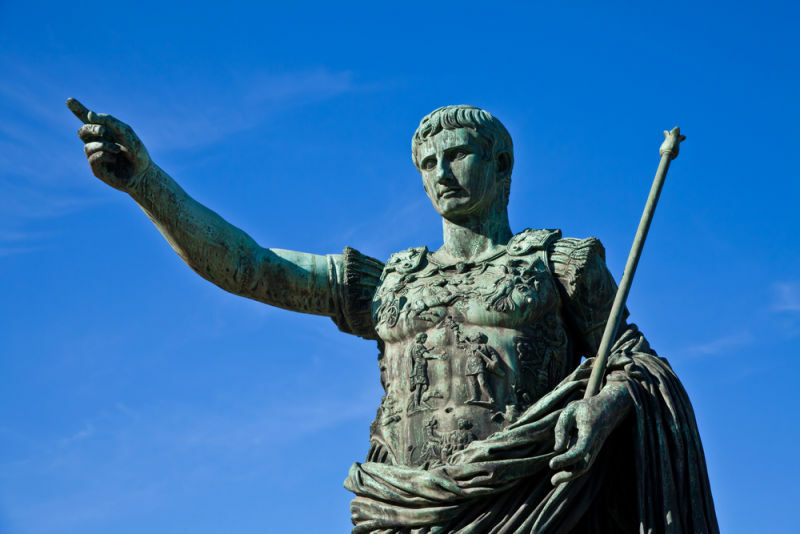 Deep Thoughts with Marc Andreessen: The Poor Have It Pretty Good! 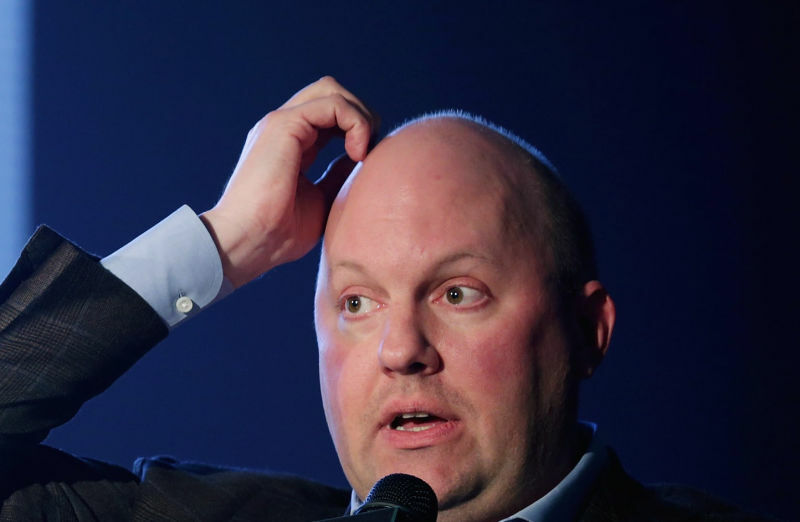 There's a reason why Marc Andreessen is an esteemed venture capitalist, and you're not. Consider the savvy of his investments, the impossible sheen of his dome, the wisdom of his tweets—and, despite apparently having never read a book, just this morning he summarized human progress in just 17 parts. 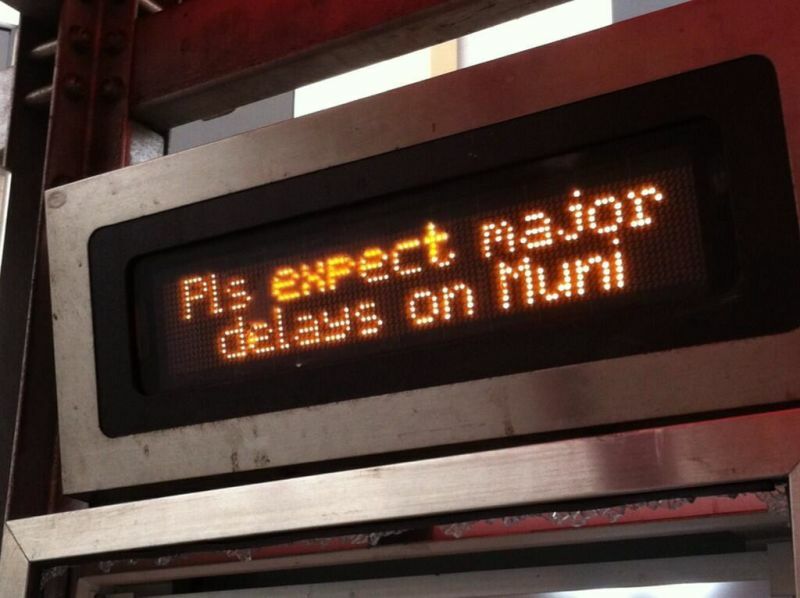 While most San Franciscans are struggling to get to and from work today following Muni's sickout, which left approximately 67% of city's buses parked in the yard, a line built explicitly to serve the Mid-Market tech corridor where Twitter's headquarters are located was up and running all morning. Twitter's new growth strategy is Facebook's old one: developing countries. eMarketer says Twitter will grow fastest this year in Indonesia, India, Argentina, Mexico, and Brazil. Good thing since eMarketer also said Twitter's internal monthly active user count was off by 60 million. Twitter is still receiving accolades for its role in the Arab Spring years later, but the corporation's decision block tweets in Pakistan for the first time ever is tarnishing its reputation as a free speech advocate. Business Insider editor Jim Edwards found a way to disrupt disclosures: buying $1,000 of Twitter stock. "I found that owning stock made me much more sensitive to news about the companies and what was going on inside them." 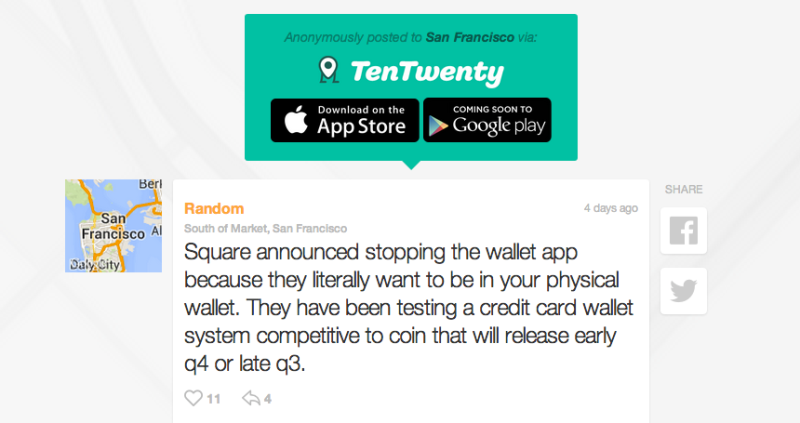 Last week I downloaded Tentwenty, a newly launched local message board that displays text and photos from anonymous users according to where they are in real time. Scrolling through my sparse feed at home in Brooklyn, I noticed that initial users weren't from the expected tech set, as well as a puzzling number of posts from Tenafly, New Jersey (not traditionally considered an early adopter mecca). We've given Twitter flak in the past for taking millions in tax cuts and giving back to its neighbors in questionable ways. But a new partnership with a homeless care group looks like the real deal. With every new social network comes new etiquette and, thus, great strides in the field of feeling slighted. But Twitter's mute function really twists the knife. Tech stocks look like a Taylor Swift concert right now. 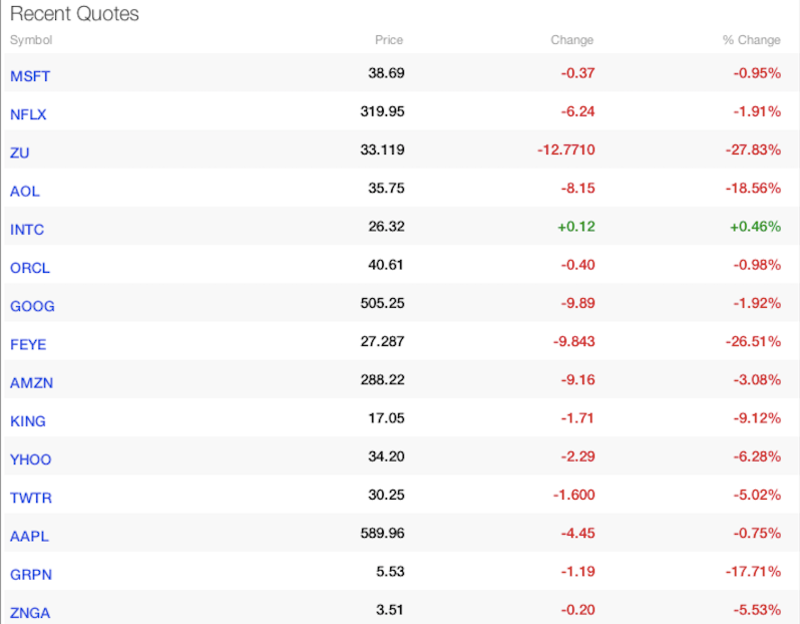 Apple, Amazon, Facebook, Yahoo, Groupon, and King (the makers of Candy Crush) were all in the red this morning. Twitter continues to hit record lows after insiders were finally allowed to cash out. Yesterday 134 million shares were traded, more than seven times the normal volume. 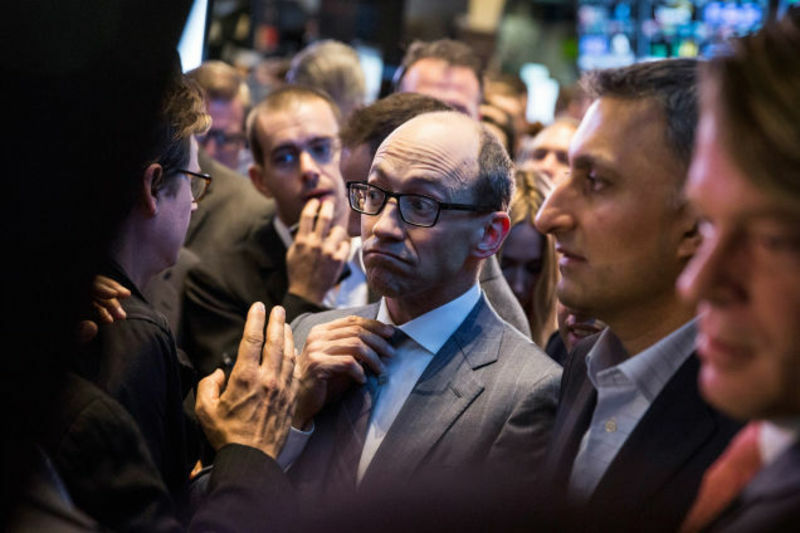 Twitter's stock is currently plummeting down almost 17 percent, but it could have been even worse. The lockup period expired yesterday, prompting fears of a crash should employees and investors decide to sell their stock. But former Twitter employees complained earlier today that they were blocked from cashing out. 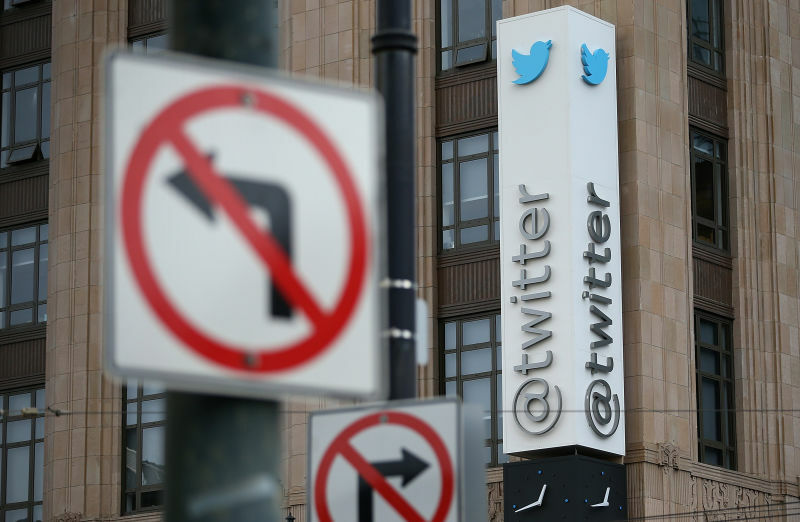 Wall Street Is Lording One Number Over Twitter. Is It the Right One? If you're one of Twitter's 255 million monthly active users or MAUs, you may have noticed company insiders sub-tweeting Wall Street. Only a suit, they scoff, would fail to recognize the value of a company your mom sees flashing across her TV screen. 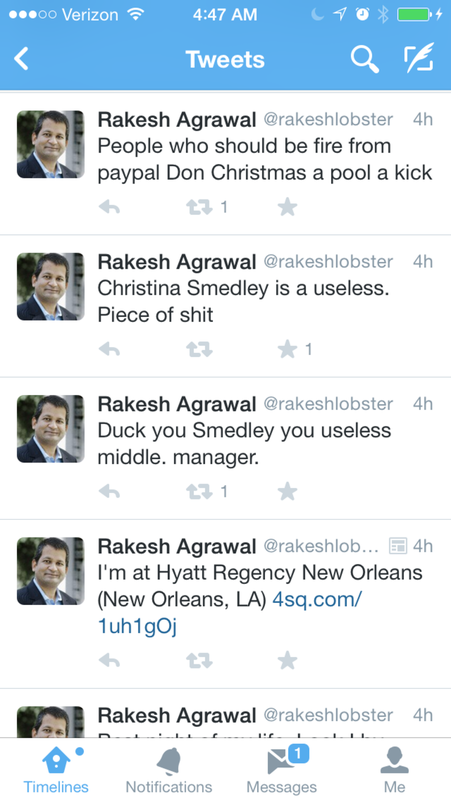 I promise, your weekend isn't as bad as PayPal global strategist Rakesh Agrawal's—he just woke up and realized he tweeted all of this stuff about people he works with. Update: he's gone.